Here are some of the best organic baby clothes we have on our site. Obviously you could say we’re biased but it’s got to be said that we have some pretty special organic baby clothing. So it’s not just great for baby but it’s good for the environment too. The easy-on envelope neckline and poppers on the legs make nappy-changing an absolute breeze too. This romper is ideal if you’re buying before the birth and don’t know what gender baby you’re having. The colours and styling are unisex and the mustard elephant print is stunning. I love the contrasting striped cuffs and feet too. This one is also 100% organic cotton and is soft as soft can be. Perfect for baby to sleep in but gorgeous enough to wear out and about too. It comes in four sizes from newborn to 18 months. This striking summery dress is just up my street. Yes I have three daughters but hey, I’ve never been a fan of pinky pastels. The vibrant colours are a real tropical pop and I love it. 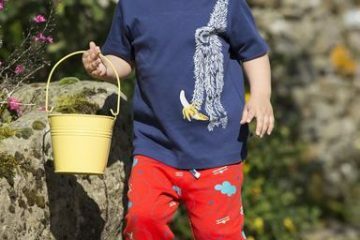 It’s nice and loose-fitting too to keep your baby or toddler cool. Perfect for holidays and comfy to wear too. 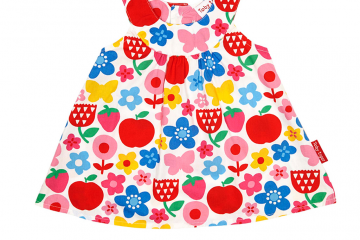 The baby dresses is made from 100% GOTS Organic Cotton and it’s machine washable at 30C. Win Win! What a lovely summery set this one is! Perfect for a girl or a boy with it’s pink, blue and corn-yellow seahorse. The tunic style top is a loose-fitting organic cotton slub fabric. The seahorse applique is classy and fun as are the gorgeous bubble shorts. The shorts contain 5% elastane to give them that extra bit of stretch. The rest is all organic cotton. I know, I know I’ve said it before but I love the super-cute hedgehog on this short sleeve baby body. It’s made from 100% GOTS certified organic cotton and is wonderfully soft on baby’s skin. The applique design is absolutely stunning and the rose-gold dots are very on-trend! You can safely bet that you’ll get people asking you where you bought it. Yes there are a few other sites we could recommend but we’ll leave that till next time!